This week, I had a little dog on a foster placement. “She’s dominant,” her owner said. I asked a little about this to get behind this rather too-often-used statement, and it seems that Little Miss likes to growl and snap when the other household dog was getting attention and she was not. It didn’t take long for this so-called “dominant” behaviour to emerge at my house; I was eating a pizza at the table and Little Miss sat under my chair like a troll beneath a bridge and snapped at anyone who tried to get near. She’s not the only dog who has behaviour issues. Last Saturday a lady in a photography group I’m part of shared a terrifying story. Her dogs were eating in separate rooms as usual, when one rescue dog turned on another as she walked behind him towards his food bowl. The size difference meant that the ‘intruder’ had her jaw broken and the owner was devastated. Then on Tuesday, I got a call from a guy who’d adopted a dog from us a few weeks ago. In fact, it wasn’t a query about the dog he’d adopted from us, but the dog he’d adopted a few months earlier from another refuge. He would happily steal items of clothing, run off into the sunset with them and growl or snap at anyone who tried to remove them from him. What could he do? It might seem that these three things are not particularly related, but they have one thing in common. Resources. Whether it is food, toys, bedding, other animals or even human beings, some dogs haven’t yet learned to “Leave it!” with good grace, whatever “it” might be. Let me make this clear: resource guarding is NOT dominant behaviour. I don’t like the word ‘dominance’ anyway in the dog world because so often we mean other things; I just can’t get my head around the ‘dogs want to rule over humans’ idea. Dogs don’t reason particularly well, so I’m pretty sure there’s no master plan at work. Resource guarding is usually the very natural behaviour of an animal which we have been breeding selectively for many thousands of years for – guess what – their excellent guarding behaviours. Long before doorbells, CCTV and on-site security, a guard dog was the best way to have a little security for your sheep, your babies, your treasure or your lap. Now that we’ve removed ‘guarding’ from the job description of most of our canine companions, they’re to be forgiven if they still struggle a little with letting go of things they treasure. After all, we spent thousands of years capturing that behavior, cultivating it and reinforcing it. Neither is resource-guarding a result of either deprivation or over-indulgence. We simply do not know what makes some items of higher value than others in a dog’s mind, or why they think someone might steal it. But it is still a problem for many dogs and can lead to situations in which the dog feels it must growl, bark or bite to keep hold of its “possessions”. So how can you treat this worrisome behaviour? The first thing is to accept that guarding, although a genetically-coded behaviour, is still something we can change. It is something that all dogs have the capacity to do and something that all dogs can be trained not to do. It often happens in changes of circumstance or where dogs become stressed. The best point to start ‘treating’ resource guarding is before it appears, when the dog is a puppy. This isn’t always possible with adopted adult dogs, but unless the resource-guarding is very aggressive, you should still be able to apply many of the techniques here. Puppies should be taught to “leave it!” and learn that humans (and other dogs) can take things from them. 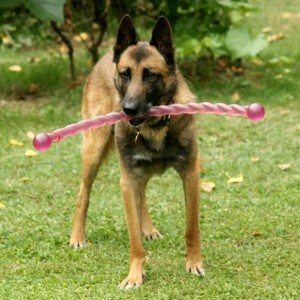 “Leave it!” is not just a good technique to use with all dogs to allow you to retrieve items safely, such as food or toys, but it’s also a great command to teach them so that they don’t pick things up off the ground or steal items. Teaching them “off” and that the approach of other dogs, cats or humans is nothing to be scared of is also vital. Grisha Stewart’s explanation of Give or Trade is excellent. Be careful, though. You don’t want your dog to make an association between stealing or guarding and getting a treat. Make sure there is sufficient interruption between “Leave it!” and the moment you reward, otherwise you could easily reinforce this behaviour. You must reward the leaving, not the growling. Good puppy training classes should tackle “Leave it!” as part of the basics. Otherwise, you should seek the advice of a dog trainer to help you. Older dogs can be taught the techniques in the same way. Recognise what your dog guards and what it doesn’t. Get to the bottom of the guarding behaviour. Make a list of things this happens with, note times, situations, circumstances. We simply don’t know what is worth guarding to a dog, and what is not. I’ve seen Tilly guarding a mouldy bread roll she’d buried and then unearthed. The mouldy bread roll is unpredictable. A chew that lasts more than a minute is a thing that is a predictable source of growls and grumbles. If she can’t finish something in one sitting, there’s a lot of dog-dog guarding going on, and she’ll even snap at me if I try to remove it. By knowing exactly what your dog guards, you can nip the problem in the bud. Note the behaviour and its intensity: head turn, stare, growl, teeth demonstration, air-snap. Note the distance at which it happens: does the dog still do it if you are 2m away? 10m away? Where’s their ‘threat line’? This helps you not only identify the problem but gives you the ability to discuss this with a behaviouralist. Pick out a reward that is worth more in value (to your dog!!) than what they’re guarding. That might be a mouldier bread roll for Tilly. The dog that turns its nose up at a cheap dog treat may well sit pretty for a piece of stinky cheese. You’ve got to know which treats will work to get the “drop”. When dogs fail to give up the object they are guarding, owners tend to think that the swap has failed. This isn’t true. The treat has failed, not the swap. A better treat is needed! Start by rewarding small “gives” or “drops” with high value treats for items of little worth. What dog wouldn’t happily swap their bowl of dog biscuits for a bit of chicken or ham? At this point, you want the treat in your hand to be absolutely valuable – and use play outside eating hours if your dog is not motivated by food. For puppies, I start by making sure I can safely remove their food if need be whilst they are eating, or that they are not so obsessed by their food bowl that I cannot interrupt them. I do the same with their toys. The first time I do this, I start with a completely empty bowl. I get their attention, I may ask them to sit or have an interruption activity like look at me, then I reward with a really high value treat in the bowl. Then wait, and do the same. Repeated around the food bowl, this means they soon learn to be very glad when I approach as my being around their bowl means MORE food! I wouldn’t do this with an adult dog with food issues, however, although it is a great way to get puppies used to the fact that someone might stop them eating, and that is perfectly okay. I will also interrupt the puppy whilst they are eating, reward them with a high value morsel of something and then let them continue with their bowl. I never want my approach to signal the removal of food. It also means that both I and other dogs can move around my dogs without starting a war. This technique also works for toys. Start with a low-value toy and reward for letting go. Even Tobby, my toy-guarding monster, will drop his toys for a piece of meat. I’ll then give him take the toy again. I don’t ever want him to think, “I drop this item and I just get that…” otherwise he won’t drop it. In all honesty, Tobby is 14 and a Malinois without a history who has a toy guarding thing and a bitey thing. He is too old and it is too infrequent for me to need to remove his toys completely, so I save this for moments when I really need that toy back, like when a foster puppy arrives unexpectedly. He cannot tolerate other dogs trying to take his toys and so I don’t want him to feel that he has to guard his stuff from puppies. I also do this by offering him a better toy. I quickly noticed that there was a hierarchy of toys and that he would swap for some but not for others. With my younger dogs, it is vital that they give things up when I ask, including toys. With older dogs, remove all triggers until you know you have overcome any guarding behaviour. Food and toys are not things that should be lying around the house with a guarder. This is the main reason that we don’t leave out food or toys at the refuge – they can quickly become objects of value to dogs who are kept in small spaces without the same level of stimulus that they get in a home. Sadly, to make the refuge more stimulating with food, chews and toys would also make it worth guarding. With Little Miss, who was guarding me when I ate my pizza (or any bits that might drop on the floor, maybe, since she had already developed a begging habit before she got here) I removed myself. I went in the kitchen, closed the babygate and fussed and petted her when I finished. For Tilly, who guards bones or mouldy bread rolls, I do the “trade” routine when bone-time is over, and then I put them out of the way. Bone-time is over when I can’t supervise them any more; it’s the same with toy time. Living in a multi-dog household which often changes in numbers and levels of training, I don’t want a situation to arise in unsupervised time. Teach your dogs these things in isolation if you have a multi-dog household and then gradually change the environment and the presence of other animals. For instance, practise the Give and Trade behaviours in isolation, then have other dogs at a distance, before moving in closer and closer. Dogs don’t generalise well so just because you have taken their food bowl away from them doesn’t mean you will be able to get a stolen shoe back from them without a snap. Neither may they understand that because you have done Give and Trade in your living room that the same principles apply in the garden or on a walk. If your dog guards you, a valued resting spot, a toy or food, it is not a good time to try training them when they are guarding. Don’t punish them for their behaviour, just ignore them. An emotionally-charged moment is not the time to try and remove something from a dog, whether they have taken it in play or they have taken it to guard. It is not a teaching moment. Turn away and walk off. Keep them away from children or other animals at this point. Whilst Tobby’s toy-guarding is a bit of a problem, my other dogs and I will just walk off and leave him to it. When a crazy terrier foster took my boot before I was due to go out, he wanted to play. Chasing him would have been a great game. He needed a stooge to run from, so I walked away and went to the fridge. Sure enough, he dropped the boot and came running within two minutes. I was a bit late leaving, but better that than ten minutes of an angry ‘chase’ game in the garden. That of course was stealing for play and a little different, but the same principle applies: if you are not there, you are not going to take whatever they have. Plus, that fridge is an interesting place that is full of things that are way more interesting than a shoe nobody is playing with or a scarf that nobody else wants. Accept that your dogs in a multi-dog household will need to tell other dogs they are too near, and that this is not always an issue. Tilly is an invariable bowl dipper. She will happily go to everyone else’s bowl and stick her head in it if unsupervised. They’re so good-natured and the food is not so important to them that they’re bothered, so they let her. It’s not nice behaviour though. However, if she does it to Heston, or if Amigo – who finishes first – does it to Heston, he’ll give them a grumble. They’re too close. It serves its purpose and they back off. I know it horrified one prospective adoptant who came to see a puppy in my care that I let my dogs take care of telling puppies not to come near them when they are lying down. Yes, my dogs growl at each other from time to time, and yes I allow it. Stares and mild grumbles are the ways that dogs communicate. A puppy who doesn’t know this will never be well-socialised around dogs and this is a major problem for some of the older puppies who arrive with me: no dog has ever told them ‘back off! !’ and so they have never had to. For their own preservation, dogs need to understand dog language and if they rely on humans to intervene and keep them separate, then you have dogs who can never be unsupervised. These are dogs that inadvertently provoke others into biting them because they don’t understand when a dog growls, it is not playing and no human will come along to stop the escalation. Teach great bite inhibition at the same time. Then if you know you really, really need to, you can take something from them by force. I’m not ever going to be a fan of prising something out of a dog’s jaws, but I know with my dogs they’ll let me if I need to, like when one found a sheep carcass and “Leave it!” wasn’t enough. Dogs who resource guard should not be treated as “dominant” dogs. In fact, many are deeply insecure and afraid. Thus they are more likely to feel cornered and that they need to protect themselves from threat. Treating dogs such as this with negativity, punishment or hostility will only worsen conditions, not improve them. If you are worried about the level of hostility that your dog is showing around particular situations, seek help from a qualified behaviouralist who can help you get to the bottom of the problem and overcome it. E-collars, pinning and punishment may stop the behaviour as the dog “submits” but it does so at a huge emotional cost. And the fabulous Emily from Kikopup. You can do the same with food bowls too. Stress and small sinks: is your dog in danger of overflowing?